The coming fall promises to be full of talking, playing, wrestling, dancing, singing, observing, and debating about improvisation! Musagetes and the International Institute for Critical Studies in Improvisation (IICSI), and the Laurier Centre for Music in the Community can’t wait to bring world-renowned Korean percussionist Dong-Won Kim to Guelph as our 2014 Improviser-in-Residence. Over the next four months, Dong-Won Kim will be bringing together musicians, artists, dancers, writers, designers, illustrators, choirs, bands, orchestras, and classes, through improvisatory music and dance. Weekly drop-in sessions will be ongoing moments for experimenting, learning, sharing, and debating. 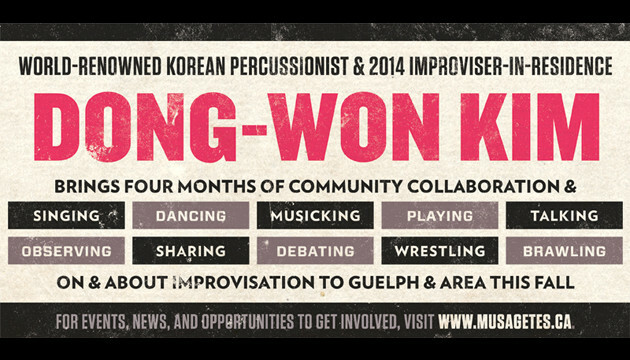 Dong-Won will also hold workshops with community groups in Guelph and Kitchener-Waterloo. The meetings in the fall will culminate in a collaborative public performance in November 2014. For ongoing news and updates, please visit Musagetes’ website or IICI’s website. On Thursday, August 28 at 7 PM, please join us at Silence (46 Essex St.) to welcome Dong-Won Kim to Guelph and find out a bit more about how to get involved with this project. The evening will begin in conversation over drinks and empanadas, followed by an introduction to this year’s Improviser-in-Residence program. Then Dong-Won Kim will be joined by longtime friends and collaborators Jeff Bird and Jeff Cairns for an improvised performance. The evening will end with a discussion about performance and improvisation facilitated by Daniel Fischlin. Dong-Won Kim will also be performing as part of the Guelph Jazz Festival with Lee Pui Ming on Sunday, September 7th at 10:30 AM at the Guelph Youth Music Centre. Multi-instrumentalist Jeff Bird is a founding member of the seminal folk group Tamarack. With Cowboy Junkies he was part of the legendary Trinity Session and continues to record and tour the world with them. He has realized 15 recordings of his own as a soloist and collaborator. Jeff has scored music for both film and television. He is also an experimental filmmaker and performance artist whose work has been showcased at festivals from Dawson City, Yukon to Vladivostok, Russia. Musagetes is an international organization that strives to make the arts more central and meaningful in peoples’ lives, in our communities, and in our societies. Musagetes works in Guelph, Sudbury, Lecce (Italy), and Rijeka (Croatia) to demonstrate how art can be participatory and socially engaged, to establish a greater sense of belonging in communities.